A10 straight cutter TGAS-for use with the A10 template. 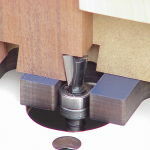 The TGAS 12 ¼ is the A10 straight cutter and mate to the dovetail cutter. The A10 dovetail cutter and the A10 straight cutter are designed specifically for the A10 template.